Need Adobe Reader for PDFs? To represent its members in formulating Association policies and to take responsibility for informing members of those policies. To represent its members in their relations with their employer and to seek to be the exclusive representative of appropriate units of school employees in all matters relating to employment conditions and employer-employee relations including, but not limited to, wages, hours, and other terms and conditions of employment. To provide an opportunity for continuous study and action on the problems of the profession. To promote professional attitudes and ethical conduct among members. To furnish the means at the local level whereby the individual member may participate in the initiation and development of policy for the Association. To furnish lines of communication between the Association and its members. To make more readily available to members the services of the Association. To encourage cooperation and communication between the professional and the community. To raise the standards of the teaching profession. To foster harmonious relationships with teachers of all levels and all sites. To provide a means of representation for its ethnic-minority members. Hours: 3:00 p.m. – 5:00 p.m. on student attendance days. and MUTA Board contact information is here. 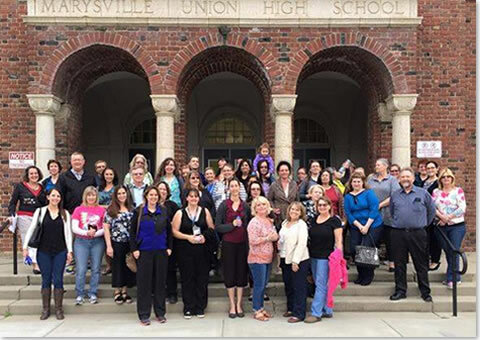 Copyright © 2009 - – Marysville Unified Teachers Association. All rights reserved.